The Daily Jaws had the pleasure of catching up with scientist Stephanie Shannon who's love of sharks and career was inspired by Jaws. Read the full interview below and post any questions you have in the comments! When was the first time you saw Jaws? I was 5 the first time I saw Jaws and instead of being terrified I was fascinated. 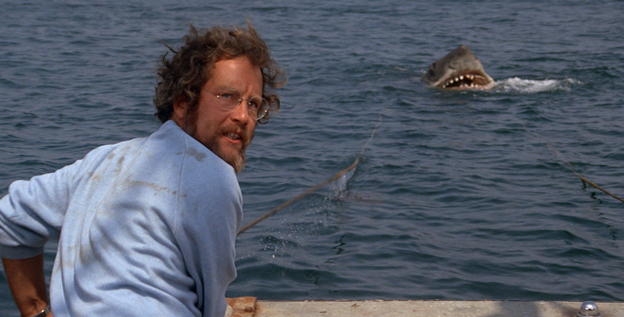 I'll never forget the first time I saw Hooper roll into Amity to look at the body and announce the bite radius was no dogfish or the famous necropsy on the dock. I knew that was who I wanted to be. Whenever we would take a family vacation to Universal studios Hollywood I remember riding the back lot tour and just in awe every time we'd go through the lake and that robotic shark would show. I was on cloud nine. Who is your favourite character in Jaws? My favorite Jaws character is Quint, the man loved his beer and in the end went down with his ship. If that isn't honor I don't know what is. I would have loved to share shark bite stories. I think it's safe to say Jaws is not an accurate representation of normal shark behavior and though it is based on some attacks from the 70's in that area it is now suspected to have not been a Great White at all. If it had been based on real sharks it wouldn't have been as awesome though am I right? Why did you become a shark biologist? My fascination with sharks began the first time my parents showed me Jaws around the time I was 5. I couldn't believe how amazing this creature was and it was "real". I began scouring the library for every book I could get my hands on (Including the one Sheriff Brody reads during his period of research). My undying love for sharks began when I read a book called "The Shark Lady" in grade school. It was a Biography about Dr. Eugenie Clark. She was an amazing diver, researcher, and Shark Biologist. The part of the book that always stuck with me was how she was able to get Lemon sharks to associate a target with food and despite keeping the target out of the enclosure for weeks the animals still remembered it meant food when it was reintroduced. What does a shark biologist do? My official title is Elasmobranch Biologist as I currently care for various cartilaginous fish. My day to day includes maintaining a healthy environment by monitoring the quality of the water, ensuring each animal is receiving a proper diet, administering any supplements or medications, training and enrichment, and educating the public. Why is understanding more about sharks important? Understanding sharks is important because they play such a key role in a healthy ecosystem. It's easy to get caught up in the dramatizations and forget just how fragile they are as a species. Without an apex predator any food web will eventually fall out of balance and fail. Without sharks helping to keep populations of various other marine species in check smaller prey could be over or under hunted. What do you think Jaws has done for sharks? I think in it's earliest years Jaws, and this was shared by Benchley himself, was bad news. The backlash was devastating to many species of sharks and they are still struggling to recover. However now there are many people who love Jaws and are inspired to protect what was once feared. I myself wouldn't be where I am without its influence. I think though it started out rough it has helped create a movement one that sets out to conserve and protect these great animals. What can the public do to help sharks? The public can do many things to help conserve sharks and our oceans. Seafood Watch created by Monterey Bay Aquarium, never buying or eating anything made with shark fins (sharks are finned and left to die at the bottom of the ocean by the thousands for soup that boasts healing properties that aren't factual). This was a very powerful campaign and it actually created a huge drop in the consumption of shark fin soup. Don't litter, watch the pollutants that you're putting into the environment, being eco friendly. What is your favourite shark? My favorite shark is the Cookie Cutter Shark, Isistius brasiliensis, though it isn't really classified as a shark anymore. I think the circle wounds it leaves are hilarious and super cool. My second favorite is the goblin shark, Mitsukurina owstoni, because how wicked is that guy? My favorite shark I care for is a Spotted Wobbegong Shark, Orectolobus maculatus. I had the greatest opportunity to snorkel with Whale Sharks and it was the most humbling, amazing, and beautiful animal I've ever had the great pleasure to see up close. Any advice for anyone wanting to become a shark biologist or learn more about sharks in general? Majoring in Marine Science, interning at Sea Life centers, and finding what drives you. There are many avenues to being a shark biologist. Some are husbandry (which is what I do), some are research (Shark Week), some are educators who do shark related stuff on the side, and more. Finding the part that makes you happy is the key. Don't give up. It isn't an easy niche to get into and sometimes you have to do things that are completely unrelated to what you want. It takes tenacity, patience, a lot of hard work, and sometimes years to get a shot.